Series TJ Coalescence- separation oil purifier adopts advanced polymer fibre as the filter medium combined with the special oil- water separating device to make TJ is good at breaking emulsion and filtering. It can effectively separate water from oil. Series TJ can work online with turbine system for breaking emulsion and filtering, also it can separate particles and mass water from light oil. Series TJ works without heating and vacuum source, less power consumption, low operation cost. Series TJ use of trolley structure, light weight, easy operation. 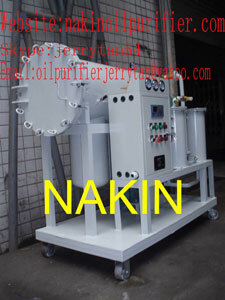 Business Description: Nakin Electromechanical Co., Ltd is leading machinery manufacture, our products are mainly transformer oil purifier, turbine oil purifier, lube oil filtration, engine oil regeneration machine in high quality and competitive price. We has the strong technology and experience in the vacuum oil purifier developing, our machine have been exported to many countries, and service in many industries.